Melt butter and set aside to cool for a few minutes. Put almond meal, whole egg and yolk, 2/3 cup honey, the almond and vanilla extracts, lemon zest, salt, and melted butter in a medium bowl and stir together with a wooden spoon. The batter will be thick and sticky. Thoroughly butter a 10-in. tart pan with a removable rim. Scoop batter into pan and spread even. Chill filled pan in freezer, making sure pan is level, 20 minutes. Meanwhile, preheat oven to 300°. Scatter almond slices over top of batter and slide pan into oven. Bake until entire surface is light golden brown, 45 to 50 minutes. (Don't overbake--the torte should be moist.) Set on a rack and let cool completely before serving, about 2 hours. While torte cools, preheat a grill to medium-high (450°). Slide 2 whole figs onto each rosemary sprig and grill until juicy and warmed through, 2 to 3 minutes per side. When cool enough to handle, slide off and cut into quarters. Serve slices of torte drizzled with 2 tbsp. 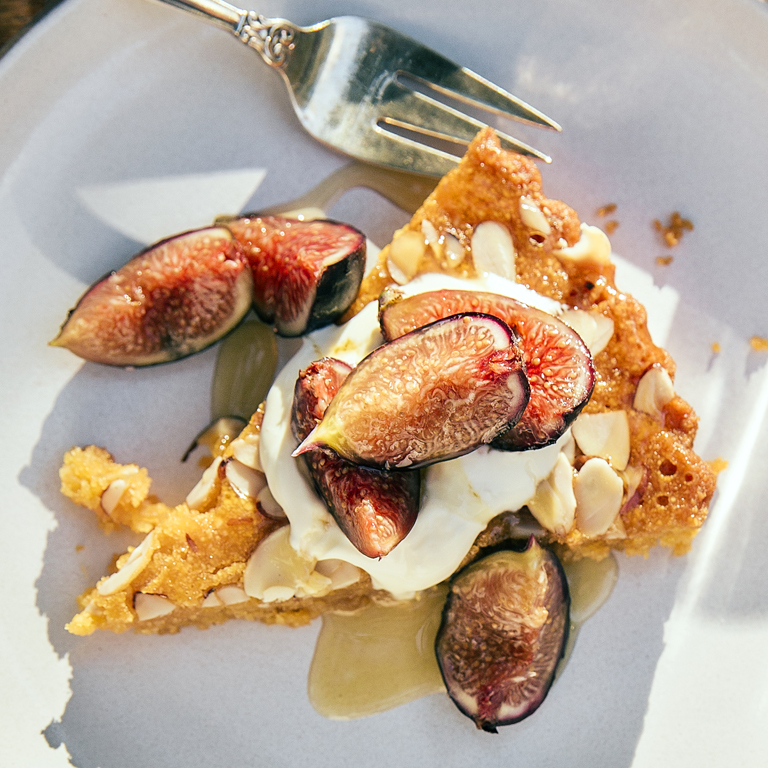 honey, dolloped with crème fraîche, and topped with a few fig quarters. *Find at natural-foods stores and well-stocked grocery stores.